Pitkin & Ruddock Ltd are Air Conditioning & Refrigeration specialists based in the UK with over 60 years’ experience in delivering complete temperature controlled solutions: Service, Maintenance, Design and Installation. Pitkin & Ruddock manage regular maintenance of the air conditioning system at Grange Shipping Limited, based near the Port of Felixstowe in the UK. Grange Shipping Limited was established in 1979 and today is heavily involved in the movement of a wide range of cargos including paper, steel, tea, fresh and frozen produce as well as continuing to develop ships agency, chartering and project cargo management. The maintenance engineer from Pitkin & Ruddock was carrying out a scheduled maintenance visit at Grange Shipping where an issue had been highlighted on a Mitsubishi Electric under ceiling mounted A/C unit. The unit is situated in one of their offices and was giving off bad odours. The coils on the indoor unit required cleaning and Pitkin & Ruddock were looking for a professional cleaning product that would do the job well and to the satisfaction of their customer. Picture – Pitkin & Ruddock Maintenance Engineer – Craig Palmer using Frionett® Activ on a Mitsubishi high wall mounted A/C unit. 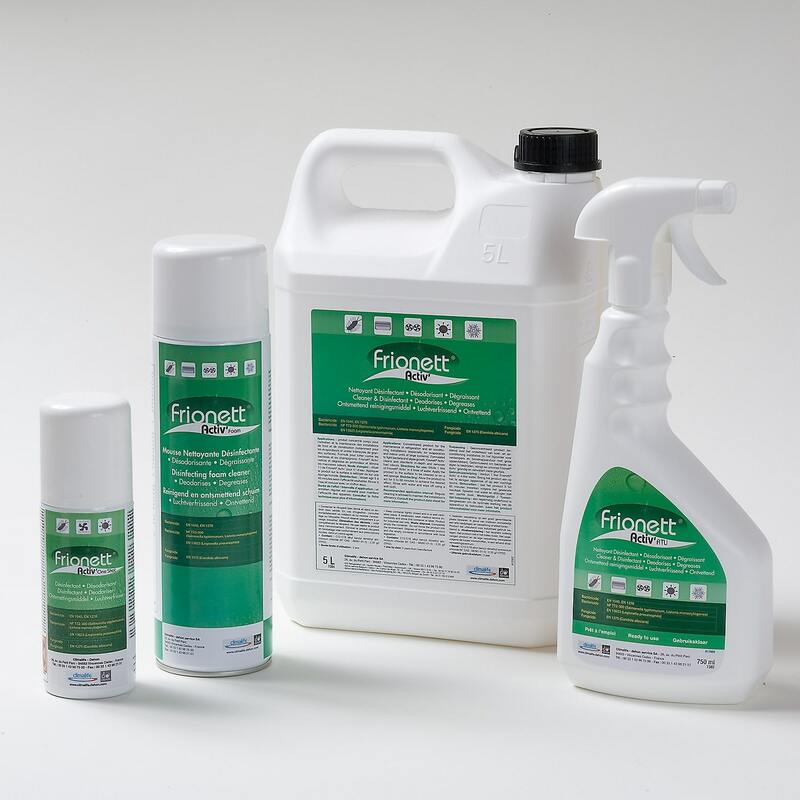 Recognising the need for a high-performance cleaning product, Climalife Regional Sales Manager - Robin Attawia recommended the Frionett® cleaning range to Pitkin & Ruddock. The Maintenance Engineer attending Grange Shipping was advised to test the Frionett® Activ as the product was the most suitable for the issue reported. Frionett® is a disinfecting, degreasing and deodorising cleanser with a fresh scent that can be used to clean refrigeration and air-conditioning equipment (including fans, evaporators and interior units). Non-toxic and approved to EU standards, Frionett® offers effective treatment against fungi, mould, algae and bacteria, including Legionella, Salmonella and Listeria. Note: Cleaning products should always be used in conjunction with guidance in their respective Product and Safety Data Sheets. Before cleaning commenced, windows were opened to ensure there was good ventilation and the power supply was dis-connected. Frionett® Activ Concentrate was diluted 1 part to 4 parts water and shaken well before use. The cleaning fluid was sprayed directly along the coil from top to bottom to remove all dirt and grime present. The dirty residue washed into the drain. Before moving on to clean the pumps, the drain was flushed through with water. 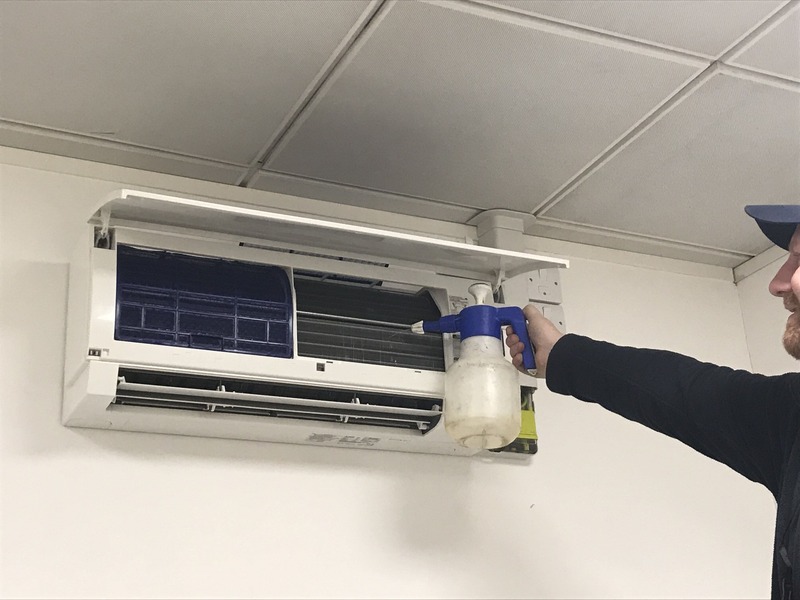 The Maintenance Engineer from Pitkin & Ruddock found the Air Conditioning System was working more efficiently and the cleaning product left the area very clean. When the unit was switched on, there was no longer an unpleasant smell coming from it. 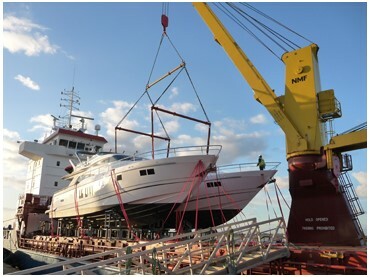 Grange Shipping were happy the issue was resolved and Pitkin & Ruddock have recommended this forms part of their regular maintenance programme. The regular servicing and cleaning of air conditioning equipment will help to optimise performance, energy efficiency and help to guarantee longer equipment lifespan. Air conditioning systems can provide perfect conditions for microbial growth. Moisture, darkness and warmth are three key ingredients for microbial growth and these naturally occurring contaminants use the moisture present in air conditioning systems as a breeding ground. This growth is accelerated when warmth is added, where fungi and bacteria can colonise and sometime proliferate to become harmful concentrations if left unattended. As Pitkin & Ruddock’s Ipswich Service & Maintenance Administrator - Debra Low says “Planned preventative maintenance minimises the risk of business interruption by highlighting impending problems before they become costly issues. They help to improve energy efficiency and enhance system optimisation for improved performance as well as ensuring you fully comply with your F-gas regulation obligations. Business benefits for end users include increased reliability, reduced running costs, quicker payback periods and potentially longer life, plus less carbon emissions."